The songs that you upload to songtree are licensed under a Creative Commons Attribution-NonCommercial-ShareAlike 4.0 International License. We are working on adding alternative licensing terms so that users can have more control over their music's rights. 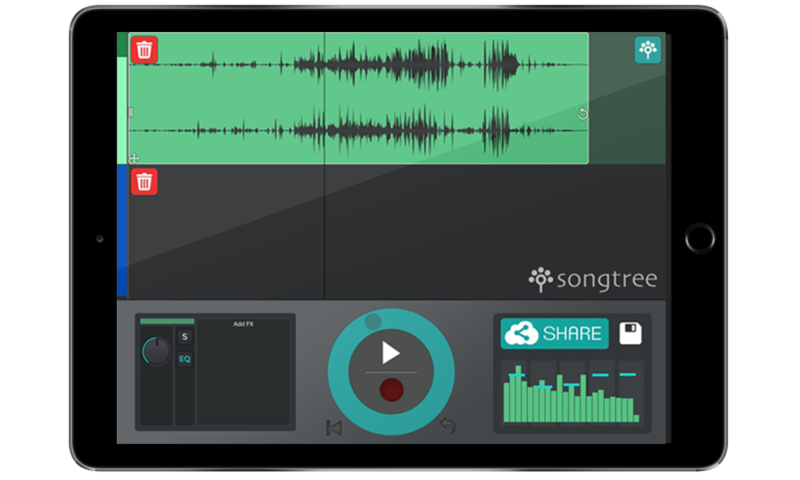 The Songtree app lets you record audio via your device's built-in microphone. You may also choose to use an external analog or USB interface to record audio at a higher quality. 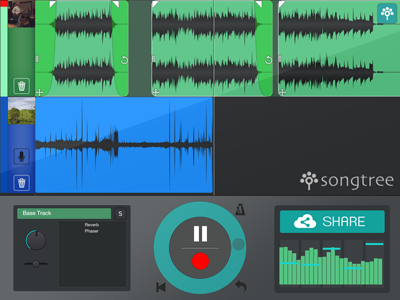 To record audio through an external device,connect your interface to your device. 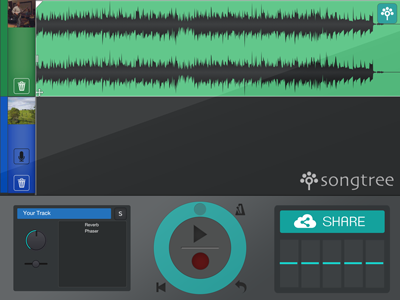 Launch the Songtree app, then open the recorder view. 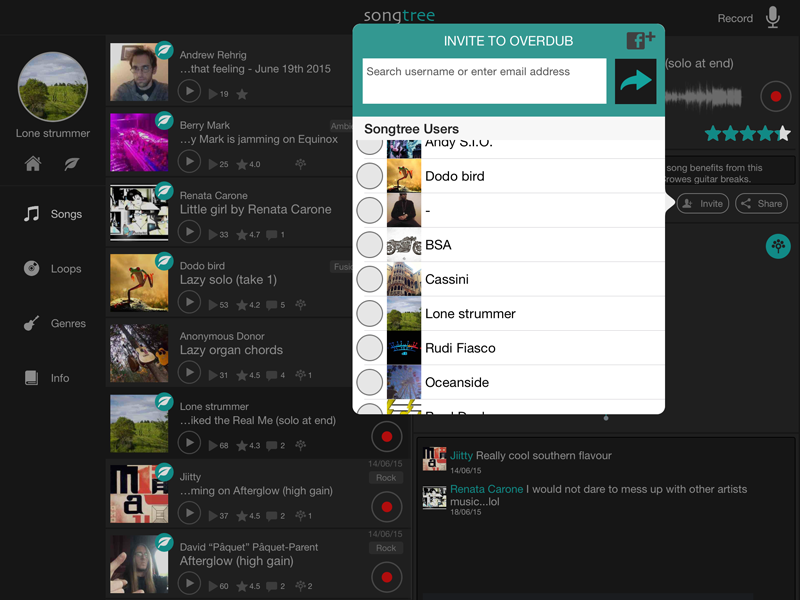 Songtree will automatically recognize your device and use it as an input for your audio. Instead of overdubbing an existing song, you may choose to start an entirely new one. 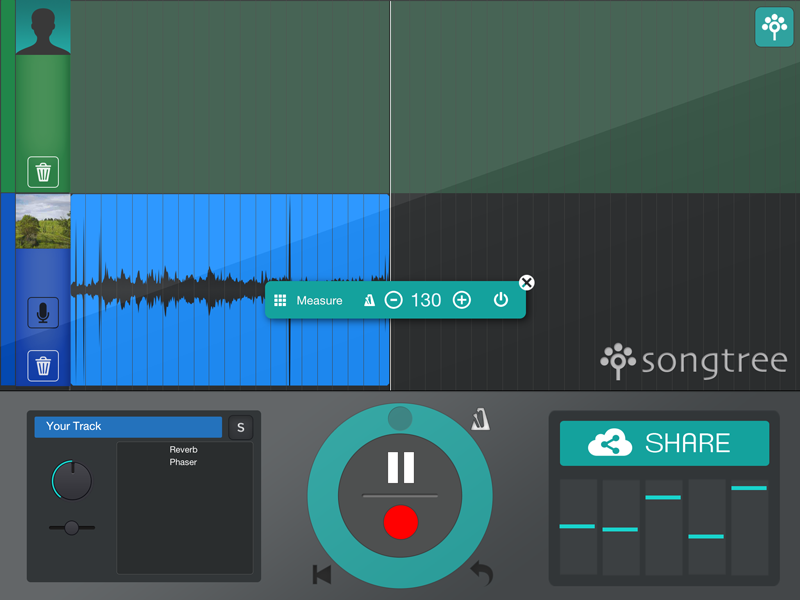 The record view lets you lay down your musical ideas quickly and intuitively. 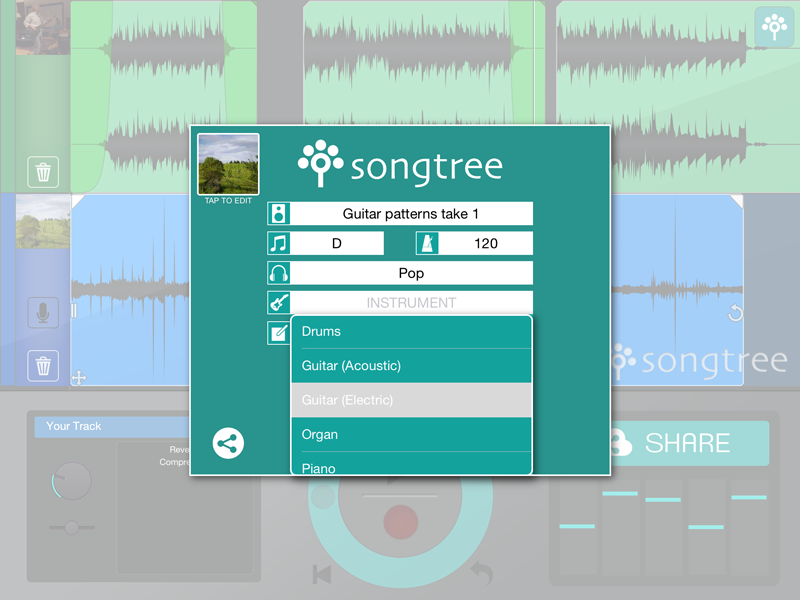 If you upload a song, rather than overdubbing one, Songtree will automatically recognize it is not an overdub and start a new tree. Tip: make sure to use the metronome, whenever possible, to facilitate other users to follow your tempo when they overdub your tracks. 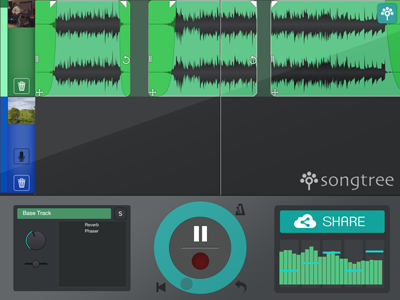 If you wish to record more than one track, it is recommended to bounce the first track by sharing it, and then create an overdub of your own track. 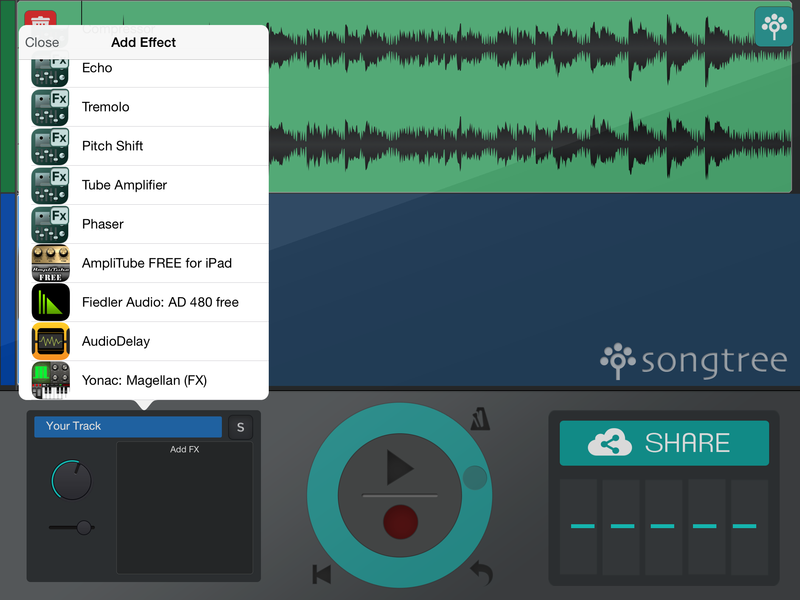 This allows to keep the parts separate for a future mix. If you wish to only share the mix of both tracks on the community, you can simply hide the first one. To hide a track, use the visibility control marked with this icon. The content does not present forms of abuse - whether visual or verbal - which may offend or harm others users. Songtree reserves the right to take down - also without notice - any content which violates these guidelines, and encourages users to report abuses. How can I contact the Songtree team?